Echo lets you easily create IEPs/PNPs for individual users. This content is visible in a read-only form to the users' teachers, but not available to students. Formerly, this kind of content was managed through File Notes; all File Notes have been translated into IEPs. In the IEP section, use the rich text editor to record specific notes about the user. Remember that admins can access and edit the notes, and the user's teacher can access a read-only version. Check the box if you want to Ignore time limit on assessments for this user, in the Accommodations section. Select from the dropdown list if you want to Limit number of options on multiple-choice questions and enter the desired number, in the Accommodations section. 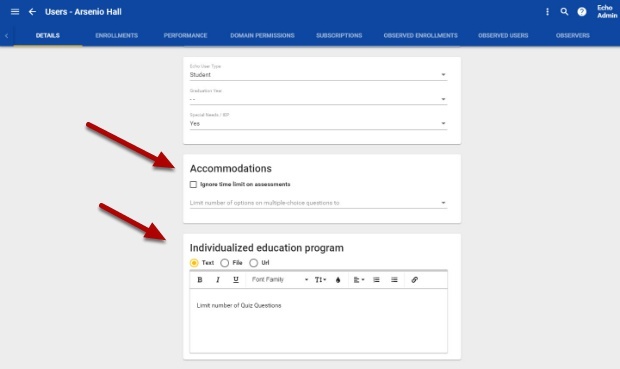 Once Accommodations or IEP's are created for a user (as either a note or attachment in the rich text editor), an Accommodations (flag) icon appears in various places of the Teacher app. When a teacher selects that student to access their Student screen, the View Accommodations appears under the students name. Teachers can click on the title and access the read-only Accommodations.